THE WINNING THEORY IN STOCK MARKET: My 3rd Book "Top 100 Diversified Undervalued Indian Stocks For FY 2017-2018"
Finally, your wait is over. 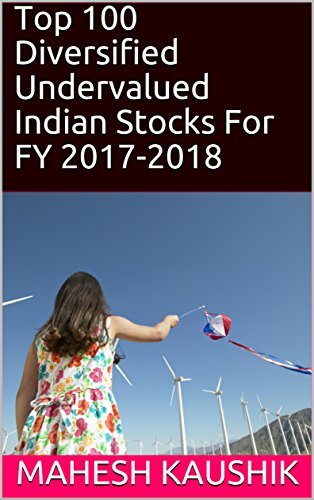 I complete my 3rd book "Top 100 Diversified Undervalued Indian Stocks For FY 2017-2018" and this book is available in ebook format from tonight 12.00 AM onwards. Kindle Unlimited subscriber read it free of charge, other need to pay INR 199. Simply add these stocks in your portfolio and make a diversified large cap portfolio for long term view. 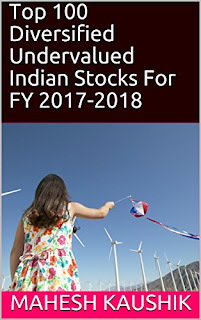 In this book, I choose top 100 undervalued Indian stocks for FY 2017-18. In next financial year, I will change edition of this book with top 100 undervalued Indian stocks for FY 2018-19. When you read this book, you understand that only five to ten companies change their position in a year so every year you need to change only a few stocks from your portfolio. So this book is helpful for those followers who have no time to research and no time to track market price of their stocks they just wanted to invest their money in blue chip stocks and their investment horizon for 5-20 years. When Paperback Book Available: - If followers demand then I consider to publish the paperback edition with pothi.com otherwise currently no plan to publish the paperback.If you want the print book then, please tell your demand in the comment box. How to read my book on smartphone or iPad: - You can download Kindle app through Google Play Store or Apple Store and read through this app. How to read directly in the browser like google chrome, internet explorer: - Set up Kindle Cloud Reader and read it directly on the browser. Price: - I am not writing this book for royalty because the stock market is a sufficient earning source for me. Language: - Currently this book is available only in English but If you able to understand this article then you also understand my book because I am also complete my education in Hindi medium and my English is plain English. New Followers First Download Sample: - Amazon also allows download sample, So before final buy first download the sample if you satisfied then buy it.